In the first in a series of interviews with women who are leaders in their field in India, The Wall Street Journal’s India Real Time met Kiran Mazumdar-Shaw, the founder of biotechnology company Biocon Ltd. 532523.BY +0.16%, and one of India’s richest women. Last month, Ms. Mazumdar-Shaw was named by Forbes as one of the most generous people in Asia. According to Forbes, Ms. Mazumdar-Shaw has pledged to give away 75% of her wealth, currently estimated at $625 million, when she dies. The 60-year-old has donated about $33 million to various causes since 2005, including to building a 1,400-bed cancer center in Bangalore, the southern Indian city where her company is based. 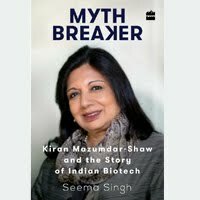 She started Biocon in 1978 aged 25 after originally training to become a brewer in Australia..
Ms. Mazumdar-Shaw recently spoke with The Wall Street Journal’s India Real Time about philanthropy and healthcare, the sexism she faced early in her career, and why she doesn't want to run for public office. The Wall Street Journal: India’s mega-rich have been criticized for not donating enough of their wealth to charitable causes. Is this criticism fair? Kiran Mazumdar-Shaw: When I talk to the very wealthy, I actually find they are doing a lot. Most people are doing things for their community; Indians in general are pretty compassionate and caring about their communities. If you look at the wealthy who come from modest backgrounds, I think they are doing a lot for their villages and communities. I think it’s a public perception problem that the wealthy in India are not giving enough. I think it has been happening for decades but it’s just that we don’t talk about it. It’s important to talk about philanthropy and it’s not just the wealthy who should be talking about it. We should also talk to the young, the people who are going to be creating wealth. You have to build a culture of philanthropy. In a country like India, we need to be sensitive and caring about the poorer, more disadvantaged sections of our country. WSJ: Why did you decide to focus your philanthropic work on combating cancer? Ms. Mazumdar-Shaw: Cancer affects everyone in some way. I've seen a lot of people diagnosed with cancer and succumb to cancer. I know that it is an awful, awful disease. What really got me focused on cancer was when my best friend was diagnosed with breast cancer and even though she was a well-to-do person, I found that her treatment costs were crippling. I thought it was such a huge challenge for any cancer patient and that’s what drove me into cancer research as well as into building a cancer hospital. WSJ: Do you think sexism exists in Indian corporate culture? Ms. Mazumdar-Shaw: It is very challenging for women to rise to the top. There is sexism. There are many, many smart women who haven’t been given the chance. I think business is a man’s world, especially in this part of the world, and women have to try twice as hard. I faced a number of challenges whilst I built Biocon. Initially I had credibility challenges where I couldn't get banks to fund me; I couldn't recruit people to work for a woman boss. Even in the businesses where I had to procure raw materials, they didn't want to deal with women. That has now changed, thankfully. As you become more successful, the gender barrier disappears. The credibility challenges you have during your growing years start disappearing when you start demonstrating success. WSJ: You head a political action group which was launched earlier this year called the Bangalore Political Action Committee. The group’s aim is to identify and support candidates for public office who are keen on bringing transparency in governance and improving the quality of the city’s public infrastructure. Why did you set up the group and what is your ultimate goal? Ms. Mazumdar-Shaw: The ultimate goal is we want better people to get into politics. It is very early days. Basically, I’m very civic-minded. I think all of us who live in this country and in Bangalore know that governance is in deficit. Because of citizen apathy, we are seeing a breakdown in governance. We need to see much greater engagement between citizens and the government to ensure we improve things. We want to train citizens who aspire to be corporators [local government officials.] We want ordinary citizens to start to play these roles. Hopefully, over the next 10 to 15 years, we’ll see these people in politics as well as there being more accountability and transparency. We are focusing on Bangalore because that’s as much as we can handle. But I think if our model becomes successful, I’d love for other people to emulate this model. WSJ: Have you ever considered running for public office yourself? Ms. Mazumdar-Shaw: I will never. Politics is a very different kind of area to be in. You need to be thick-skinned and you can’t really have your own ideas, you have to conform to a particular ideology. I don’t think I can do that because I see good and bad in all of the political ideologies of parties in this country. I think I’m a good influencer, so it is much better to be outside politics and to do what we are trying to do through BPAC, rather than be part of politics directly. WSJ: What would you like to be remembered for? Ms. Mazumdar-Shaw: I’d like to be known as someone who was committed to creating affordable healthcare.